Local play has full house and outdoor setting | Where to next? It’s a special treat when you can enjoy local experiences even though you are just visiting a place for a couple of days. We were going to stay with Leslie, Wayne and Sarah, east of Toronto. When Leslie and I discussed an arrival date, she said they were going to a local play on the Monday. That sounded perfect. Poor John and I like to support local theatre (called repertory theatre in Australia), so we asked Leslie to buy us tickets. About 5pm, we headed off to the 4th Line Theatre’s production of St Francis of Millbrook. Even though opening night wasn’t until Friday, we arrived to find a full house and perfect weather. 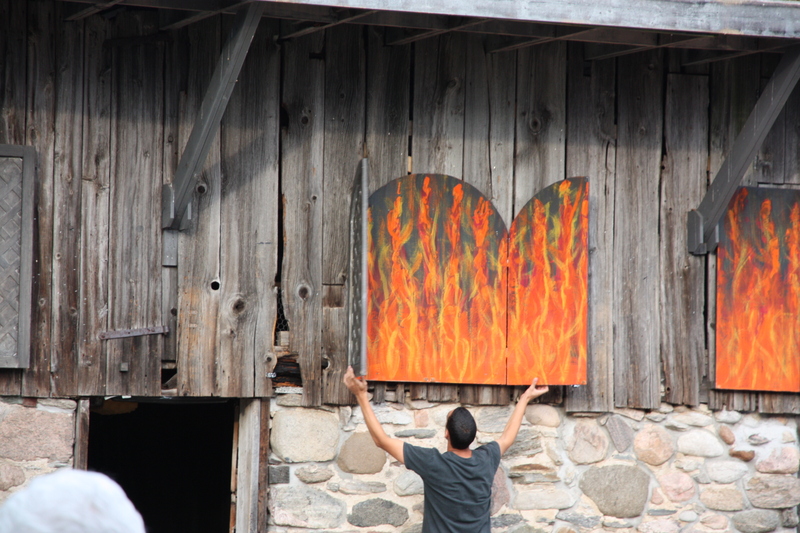 The 4th Line is Canada’s premier outdoor theatre company. 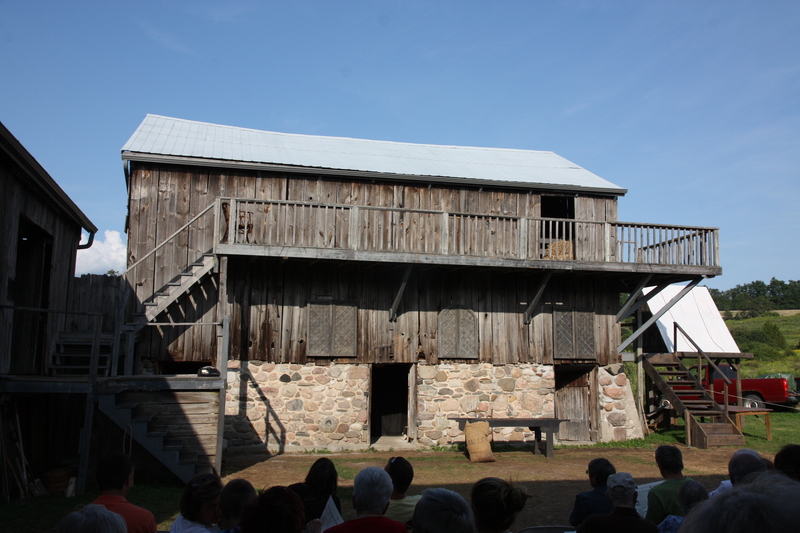 Now in it’s 21st season, the company performs two locally-inspired plays per northern summer at Winslow Farm. Robert Winslow, the company’s artistic director and fifth generation at the farm, likes to think that the plays are the farm’s ‘creative crops’. Every second year, 4th Line has a competition to get play ideas from professional playwrights. This summer’s plays—Queen Marie by Shirley Barrie and St Francis of Millbrook by Sky Gilbert were both winners. St Francis of Millbrook is about a hockey-playing teenage boy who is growing up gay in a rural community in Ontario. He loves St Francis of Assisi and Madonna, and is trying to figure out how to cope with the turmoil in and around him. In addition to sexuality, the play touches on bullying, alcoholism, abuse, sibling friendships and rivalry, aspirations and dreams. It was a sensitive and bittersweet production—with tears and laughs and some very kitschy parts thrown in for good measure. I liked that the program said 35 racing pigeons would be released (they were) and that a horse would appear. The horse’s part, which was small, was shared by Poncho and Rusty. Perhaps one of them couldn’t make it to all the rehearsals? I also liked that the play involved about 35 actors, plus many staff, volunteers and more. What a great community event! P.S. Photos were not permitted during the play, so these are from intermission. 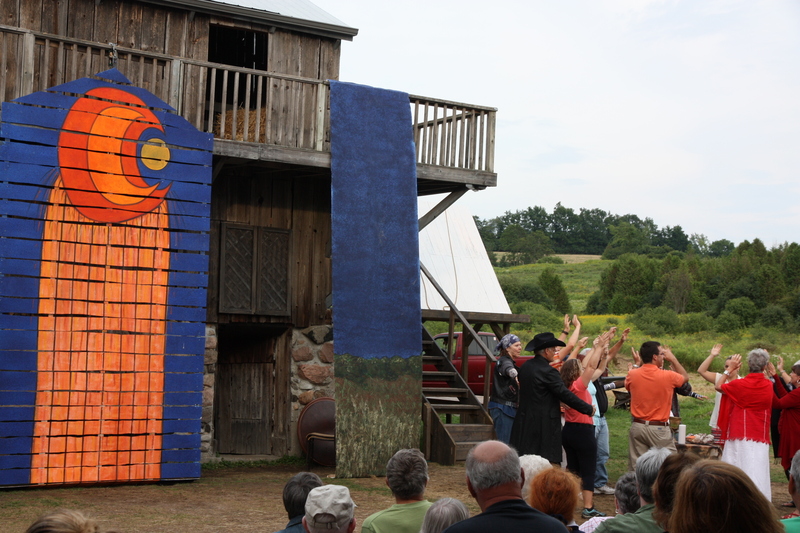 By the way, Winslow farm was the perfect setting for this play. P.P.S. The next night we enjoyed a feast at home. ← Yorkshire puddings and butter tarts—oh yum! What a wonderful experience! I’m glad you were able to get tickets and the play sounds really good too. Canada sounds every bit as good as I’ve always imagined it to be. Canada was great fun—excellent company, scenery, food and entertainment. We’ve already promised everyone we’ll be back. The guy and the horse were pure Mills and Boon (Australia’s romance novels). That part was so much fun and such a good laugh. Can still see it in my mind’s eye! Outdoor theatres and concerts are wonderful experiences. Are you in Milwaukee? I love Wisconsin and spent my childhood summers in Lake Geneva. What a fantastic state. I have a cousin living and teaching in Milwaukee.